Stop everything and paint on your best frown. Grumpy Cat Little Golden Books are on their way to a bookstore near you. You probably remember Little Golden Books as the ones dominating your childhood bookshelves with their signature golden spine. And now they're moving on to modern memes — this is not a drill. According to a Wednesday press release, Random House plans to publish three Grumpy Cat-themed titles in its Little Golden Books line. 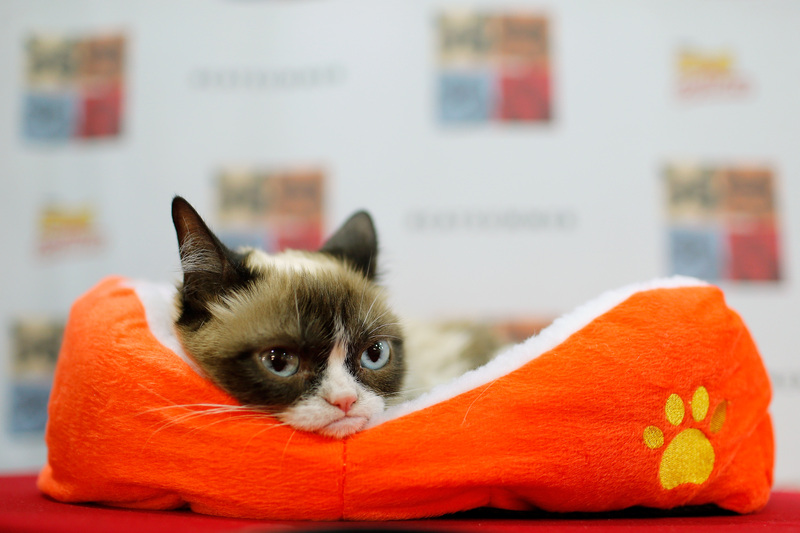 The first book, The Little Grumpy Cat That Wouldn't , has a slated release date of July 26, 2016. The first book's story centers on Grumpy Cat's resolution to say no to her friends' suggestions of fun, new activities. (Just like when you're already having wine in your pajamas and your friends call to go out.) Lest you think the Little Golden Books will change Grumpy Cat's surly demeanor, Random House assures us that "[i]n the end, she is right. Having fun is awful." Grumpy Cat — born Tardar Sauce in 2012 — has captured the hearts and minds of the Internet populace. She has over 10 million followers and even got her own movie, titled Grumpy Cat's Worst Christmas Ever, in 2014. The Little Grumpy Cat That Wouldn't won't be her first book, either; the Friskies spokescat already has two bestselling photo books to her name. When asked how she felt about the deal, Grumpy Cat replied: "The Grumpy Cat Little Golden Books will be the cutest books ever. It’s going to be awful." I can't wait.